Visit the Jeffco Sheriff Blog for most current information or follow updates on Twitter by following @jeffcosheriffco or the hastag #LowerNorthForkFire. A PIO will present a citizen briefing at W. Jefferson Middle School at approximately 9:00 AM. Overnight the fire was relatively stable. Fire crews made progress through the night in protecting structures. Today’s strategy is to gain containment around the fire while continuing to protect structures. Today’s fire behavior is expected to be similar to yesterday but with slightly higher winds. The winds could result in more robust fire activity. The fire will also most likely become more intense as the temperature rises throughout the day. The fire has continued to exhibit a tendency to start spot fires in a wide area. Our Incident Management Team Liaison Officer will be working with representatives from Century Link and Intermountain Rural Electric Association (IREA) to evaluate current damages and to begin formulating a plan to restore services to affected areas. The fire will be actively engaged from the air today. The air support resources available today include two Heavy P2V Tankers and one SEAT plane dropping fire retardant and four helicopters conducting water drops. These aircraft will be supported by additional command and observation planes. Additional resources are being ordered. The weather forecast for today show winds becoming increasingly southwest with speeds in the 8-14 MPH range with gusts up to 20 MPH specifically around the higher ridges. Humidity is expected to drop relatively low by mid afternoon to around 10% or less. The new command post location, at Conifer High School, is up and running. The Red Cross continues to host the evacuation shelter located at West Jefferson Middle School. A PIO will present a citizen briefing at W. Jefferson Middle School at approximately 9:00 AM. The Jefferson County Sheriff’s Office will continue to man road blocks around the fire perimeter. At this time we are not allowing anyone back into the evacuated regions. We ask that you continue to avoid to area around the fire in order to allow for quick and safe traffic for emergency vehicles. Conditions on the fireline overnight were relatively stable. Today's fire strategy will focus on moving from primarily point protection to establishing containment. There will be a media update at 7:30 AM at Conifer High School Parking Lot. Stay tuned to this blog for further updates. We will also be posting updates via @jeffcosheriffco on twitter. Below is information received from GayLene Rossieter, Acting Fire Information Officer, Colorado State Forest Service. Start Date: Sunday, March 18, approximately 1:15 p.m. Significant Events: High winds and thick smoke mixed with dirt decreased during the night, helping firefighter contain the fire. Today, fire crews and deputies drove through the burn area to manage hot spots and flare-ups. The Civil Air Patrol surveyed the extent of the fire’s damage earlier today. Resources: Primarily local emergency response agencies, including nine volunteer fire departments and four other volunteer fire departments on standby. Regional agencies from northeast Colorado and western Kansas also assisted to control the fire. The fire situation rating for the Rocky Mountain Area remains at Preparedness Level 1, indicating that there is minimal large fire activity nationally. Most Geographic Areas have low to moderate fire danger. There is little or no commitment of national resources. A Red Flag Warning is in effect until 7 p.m. tonight for southern Colorado, including Baca, Prowers and Eastern Las Animas counties. For more information, go to www.weather.gov/alerts-beta/co.php?x=1. A map can be viewed at www.wrh.noaa.gov/firewx/main.php. This afternoon will be partly sunny in the area of the Heartstrong Fire with a high near 58 and northwest winds between 5 and 10 mph. Tonight will be mostly cloudy with a low near 30. Blustery north winds between 5 and 10 mph may increase to 15 and 20 mph with gusts possible as high as 30 mph. This report is also available online at http://csfs.colostate.edu or download the Heartstrong Fire Update. Flood prone areas have been identified in 267 of 270 cities and towns and in all of the 64 counties in Colorado. Between 20 and 30 large magnitude floods (in terms of peak discharge) occur somewhere in Colorado every year. In fact, 40 percent of Colorado’s presidentially declared disasters and emergencies stem from flood-related events. Too often, floods negatively impact people, property, infrastructure and critical facilities, economic and cultural assets, and the natural environment. FEMA and the State of Colorado provide several grant programs to support state and local flood mitigation efforts. Flood Mitigation Assistance (FMA) program provides FEMA funds to assist States and communities implement measures that reduce or eliminate the long-term risk of flood damage to buildings, manufactured homes, and other structures insured under the National Flood Insurance Program (NFIP). These funds support both flood mitigation planning and projects to implement measures to reduce flood losses, such as elevation, acquisition, or relocation of NFIP-insured structures. Repetitive Flood Claims (RFC) is a FEMA program to assist States and communities reduce flood damages to insured properties that have had one or more claims to the National Flood Insurance Program (NFIP). RFC provides funds to reduce the risk of flood damage to individual properties insured under the NFIP that have had one or more claim payments for flood damages. State Hazard Mitigation Grant Program (SHMP) is sponsored by the Colorado Division of Emergency Management in support of a variety of mitigation projects, including floods. This program may provide support for flood related mitigation activities such as hydrological studies, benefit-cost analysis, and planning. For more information about this program or to make a request for financial assistance, please contact Scott Baldwin at 303-852-6696. Technical Assistance Grants for Flood Response from the Colorado Water Conservation Board may provide a limited amount of funds to assist local governments with flood assessment, feasibility, design and planning needs. These funds are intended to assist local governments who are expected to provide a significant cost share toward final products. With limited exceptions, these funds are not to be used to help fund construction. These funds are awarded to requesting local governments on a case-by-case basis, based on the amount of funds available in any particular year and the amount of money requested. Not all requests will be funded, but consideration will be given to all requests. For more information about this program or to make a request for financial assistance, please contact Kevin Houck at 303-866-3441 x3219. Please contact Micki Trost, CDEM PIO, with any questions or to submit information for next week at micki.trost@state.co.us. Attend this free workshop on May 15 to hear from an incredible line up of presenters/panel members from Joplin, Missouri, North Dakota and Colorado. Registration is being conducted through www.co.train.org with Course ID# 1031889. Details regarding the workshop are included in the course flyer. Seating is limited and will be accepted on a first come, first served basis. Developed for the Department of Natural Resources, Colorado Water Conservation Board (CWCB), the Colorado Flood Decision Support System provides a one-stop shop for floodplain and emergency managers for snowpack, streamflow, flood maps, and other related data to allow them to estimate risk and near future conditions up to and above a NWS flood warning and alert. Future phases may include incorporating more data layers and possibly even a mobile application for smart phones. Customer feedback and suggestions are welcomed for future phases of the CWCB FloodDSS and can be sent to chris.sturm@state.co.us or carolyn.fritz@state.co.us. 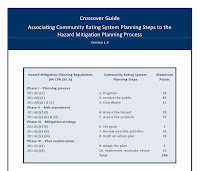 Both the CRS manual and local mitigation planning guidance are being revised for 2012. 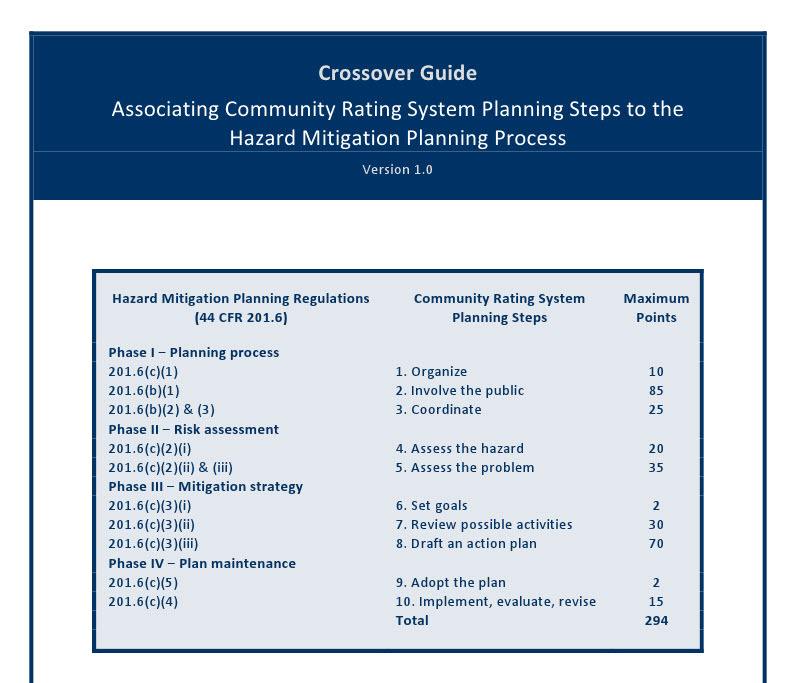 Proposed changes to the CRS Coordinator’s Manual may be found at CRS2012.org, while the Local Mitigation Plan Review Guide contains the latest updates for mitigation planning. The crossover guide will be revised to reflect these changes once both are finalized. As it currently stands, for every 500 CRS points a community earns, NFIP flood insurance premiums are adjusted downward to reflect the greater amount of planning completed to reduce the impact of flood hazards on the community. Some communities may reach their next 500-point threshold by earning points available for CRS planning credit. Please visit the COEmergency website to download both PDF and Excel formats of the EOC Position Specific Task Books. As a result of feedback received at the Colorado Emergency Management Conference this week we are releasing the Excel version of the task books so that it will be easier to modify the task books for each county or agency. The task books are available under the EOC Position Specific Task Books tab on COEmergency. If you have specific questions about the task books contact Lori Hodges at lori.hodges@state.co.us.